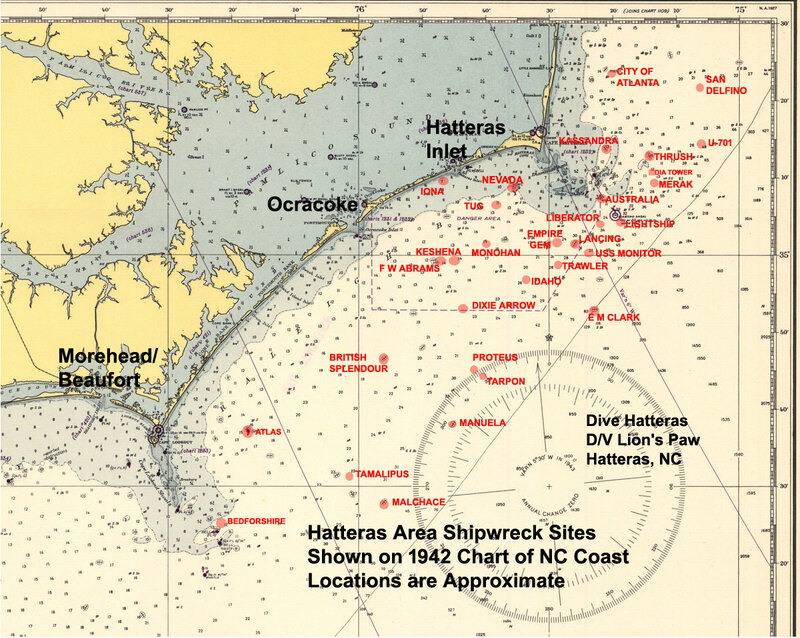 Sailing from Hatteras Inlet, Dive Hatteras visits shipwrecks located from north of the Diamond Shoals and south to the waters off Ocrakoke Island. There are a wide variety of shipwrecks to visit for your diving adventures each offering a unique experience. Of course the depths in the brief descriptions are approximate - always use your gauges! Australia: Texaco Oil company lost a large tanker to the U-332 on 3-16-42. She’s in two sections at a depth of 100’ to 110’. If you like artifacts and sharks, this wreck's for you. British Splendour: A British Tanker sunk 4-6-42. Laying at 100’ to the sand, the stern section rises high and is a great penetration dive into the machinery spaces. Vis is usually very good on this wreck. Dixie Arrow: One of our most popular dives, this Tanker is in only 90’ of water. She is very easy to dive and navigate around having high relief and a very defined layout. Diamond Shoals Lightship: The Diamond Shoals Lightship was sunk by shellfire from the German U-Boat, U-140, during WWI and lays in 180+ feet of water just off the shoal that she warned mariners away from. Empire Gem: Another British Tanker, the Gem lays at 145’ with the bow section upside down. The stern is on the port side though with the decks rising to appx 110’. One dive here and you will know why she’s affectionately called “the Gem”. F. W. Abrams: This Tanker was a victim of "Friendly Fire" when she struck several mines in the Hatteras Minefield. Now she sits 80 feet deep and is a great dive site. Hesperides: The Hesp is less than 1/2 mile from the Northeastern on the shoals and is also very intact. Swimming between the decks at just 30’ is a neat treat. Kassandra Louloudis: When she went down the Loulou was carrying a large mixed cargo of war materials for the Brits. She’s in 75’ to 80’ of water on the outer Diamond Shoals and is one of our personal favorites. Catherine M. Monahan: A four masted sailing schooner that went down in 1910 in 100’ of water. Idaho: This steam paddlewheel vessel was recently identified as the Idaho, a ferry that once served the New York City area. She foundered here in 1895 while under tow and now sits over 160 feet deep. Keshena: This tug went to the bottom in 1942 after striking a mine. She’s at 90’ and still yields artifacts. Lancing: This large converted Whaler is laying upside down at 160’. A great dive for the experienced diver that have the ability to do deep penetration diving. Liberator: A freighter that caught a torpedo in ‘42, she lays at 110’ not too far from the Australia. Manuela: Freighter sunk by U-404 on June 24th, 1942. She was loaded with sugar and is at 150’ to 165’- a sweet dive. Merak: The Merak was hauling coal when she was attacked by U-140 and sent to the bottom (WWI). We think she might be a wreck we dive off Diamond Shoals. Mystery Tower Wreck: This is a wreck site that is not yet identified with depths from 120 to 145ft. We have ideas what she may be, come dive her and search for clues with us. Nevada: The Nevada is a small wreck site that sits in 72 feet of water, about five miles East of the inlet and not far offshore of Frisco. She went down in 1868 and all that remains is the cargo, boilers and an unusual single cylinder steam engine. Northeastern: This small tanker foundered on the Diamond Shoals in 1904. Today she sits upright and very intact in just 45’ of water. A splendid dive with lots of fish and bottom time. Proteus: Laying less than 1 mile from the Tarpon, this Luxury Liner went down in 1918 after a collision. She is large wreck sitting 120' deep with big fish, lots of artifacts, and normally great vis. Tamaulipas: A German torpedo sent this tanker to the bottom with 10,200 Tons of oil on April, 10th, 1942. A long way from the inlet, she rarely gets dived, but is a spectacular site with depths to 160'. Tarpon: A WWII U.S. Submarine which foundered while under tow, she is now resting in the sand at 140’ with the decks at just 115’. This boat is still very intact and is a very popular dive for the advanced. Trawler: A yet to be identified fishing trawler laying on her side at 160 feet. She apparently went down in the late sixties or seventies and is almost fully intact with many of the nets still laying about. Tug Wrecks: Just five miles offshore from the Sea Buoy are the wrecks of two tugs and a couple of barges. They were sunk as part of the artificial reef program and are some great diving in just 65 of water as they are surrounded with sea life and are easy to navigate. U-701: The German Submarine U-701 is located 10 miles East of the Diamond Shoals Tower, with the majority of the wreck site covered by the sand. When conditions allow a dive, she is exciting to see due to the history and uniqueness of the wreck. This site is 110 to 120 deep and is for advanced divers only due to the ever present current. Veturia: An old steamer, she lays on the outer Diamond Shoals sometimes covered by the shifting sands. Wetherby: This Steamer stranded on the Southwest point of Outer Diamond Shoals in 1883. Today the engine, boilers and pieces of the hull are in 25' to 30' of water when not covered by the shifting shoal. Shipwrecks on the Beach: We often get asked about wrecks sites accessible by swimming from the beach so here is some information about the wreck sites that I know about that can be reached this way.